This refreshing candle makes a wonderful treat for yourself or a friend in need of an effective pick-me-up. Our grapefruit, tangerine, and vetiver blend is zesty and bright, with top notes of citrus blended with middle notes of warm amber and wonderful earthy vetiver—all combined in our own unique 100% natural wax blend. Once named the ‘forbidden fruit’, energising grapefruit is actually an accidental combination of the sweet orange and the pomelo (or shaddock), both of which were introduced in the 17th Century from Asia. Currently one of the ‘Seven Wonders of Barbados’, the grapefruit has so many exciting properties—not least its ability to brighten, uplift, and provide a mental boost. The addition of mild vetiver adds a gentle, musky aroma that is a popular addition to many perfume blends. In aromatherapy, vetiver is known as a ‘nervine’ because of its ability to calm the nerves, reduce stress, and relieve nervous disorders. Vetiver is also thought to have sedative properties that can help with anxiety, restlessness, and nervousness, while alleviating the symptoms of insomnia. Juicy tangerine has an addictive, sweet fragrance that you’ll want to return to time and time again. Aside from its wonderful aroma, this popular essential oil is widely used to manage stress and soothe anxious feelings. Together, these three pure essential oils have been expertly combined by our Perfumer to bring you a fragrance that is both harmonious and euphoric. 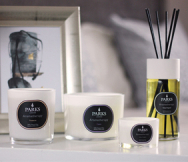 Captured in natural wax and poured into a stylish pot that you’ll want to keep after use, this exquisite candle makes an ideal, thoughtful gift for an eco-conscious friend or loved one in need of some pamper time.